Botero inspired the opera L’elisir d’amore – Curves open, powerful colors, stocky figures, dynamism, humor, voices. The opera buffa L’elisir d’amore (The Elixir of Love), of Gaetano Donizetti , climbs this May to Teatro de la Maestranza in Seville with a show in two acts the romance, mockery and satire are the stars with figures Colombian artistFernando Botero designed throughout his long career. The series of pictures Circus inspired stage director Victor Garcia Sierra to recreate the bucolic world of Adina and Nemorino in a work first performed in 1932 in Milan Teatro della Cannobiana. “I started to find in each of the figures of the author to the characters of the opera and so I was putting together the cast. Even each member of the choir has its own costume design. Botero was gentilísimo, saw all the characters and was approved. We even sent a dossier with all his drawings for us to study what fit best, “says García Sierra before the premiere of the play this Friday in Seville and also represent the 16, 18 and 21 May in the Maestranza theater, at 20.30 . Filter love that frames the adventures and misadventures of Tristan and Isolde makes believe the humble and shy farmer Nemorino the elixir sold by a traveling doctor in town is going to do to win the heart of the refined Adina, who wander the stage with a costume that evokes the picture the girl sunflowers , with its white-collar blue dress. Witness the romance threatened by the conceited Sergeant Botero will be the strongman wrapped in a snake, the peasant wearing orange Gianetta eight acrobats, stilt walkers, jugglers and five children. “I want to be a party to come to the theater, fine arts should not always need an expert next. Must be cleared of problems from home and enjoy our colors, “says García Sierra. This version of the play, which premiered in 2014 in Brusseto (Italy) and was also represented in the National Grand Theater of Lima, is produced by the International Opera Nausica of Parma and has in this show with the chords of the Royal Seville Symphony Orchestra. 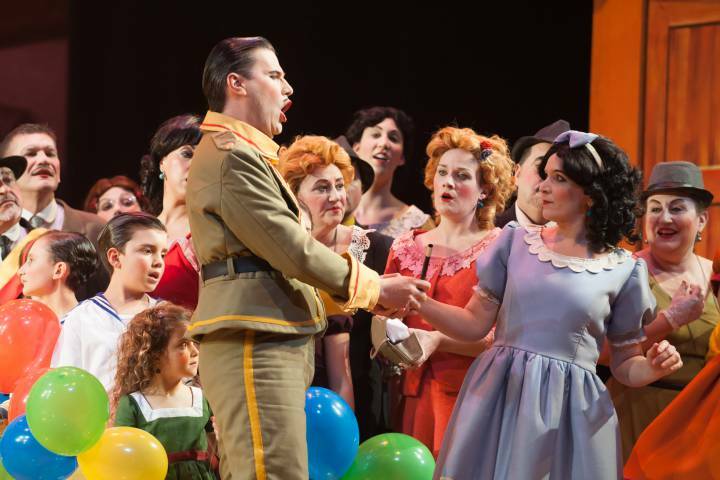 “As in The Barber of Seville , the work has five singers, but in this case the orchestra has more prominence and choir great weight in all function,” says musical director Yves Abel, which It stresses that this opera approaches the bel canto of Rossini. The Spanish city hosts the comedy spirit of Italian art with the imaginary one day a Colombian devised. Botero inspired the opera L’elisir d’amore.